Woodham Junction is a major waterways place minor waterways place place on the waterways major waterways place village town city at the junction of the Basingstoke Canal with the River Wey Wey Navigation. 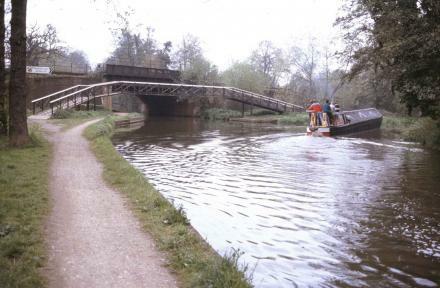 Odiham Castle Stop (End of Navigation) is on the Basingstoke Canal, 30 miles and 6¾ furlongs and 29 locks to the west. Thames - Wey Junction (Junction of the River Thames and the River Wey. Weybridge town centre nearby.) is on the River Thames (below Oxford), 3 miles and 4 locks to the northeast. Byfleet is on the River Wey Wey Navigation, 2 furlongs to the south. The nearest place in the direction of Odiham Castle Stop is Woodham Bottom Lock No 1; 2¼ furlongs away. The nearest place in the direction of Thames - Wey Junction is Woodham Junction Motorway Bridge; ¾ furlongs away. The nearest place in the direction of Byfleet is Woodham Junction Bridge; a few yards away. 104 High Road, Byfleet, KT147 — 1420 yards to the southeast. Parkside, New Haw, Addlestone, KT15 3 — 385 yards to the west. Moated Farm Drive, Addlestone, KT15 2DW — 1487 yards to the north. 31 The Broadway, New Haw, Addlestone, Addlestone, KT153 — 1336 yards to the west. West Byfleet — 1440 yards to the southwest. London — 443 yards to the east. Vickers Drive, Weybridge, KT130YU — 935 yards to the east. West Byfleet — 1274 yards to the southwest. New Haw, Addlestone — 1161 yards to the north. Brooklands Drive, Weybridge, NW11 6 — 1068 yards to the east. Byfleet Rd, Addlestone — 1555 yards to the north. Jack carroll tattoos 12-18 Claremont Road, West Byfleet, KT14 6DY — 1498 yards to the southwest. Woking — 272 yards to the east. Weybridge, KT13 0 — 1568 yards to the east. Addlestone — 1141 yards to the west. 3 Dorset Way, Byfleet, KT14 7LB — 273 yards to the east. Unit A1, Connect Live UK Ltd, Weybridge, KT13 0YU — 833 yards to the east. 1 Abbot Close, Byfleet, KT14 7JN — 318 yards to the east. Byfleet Village Hall, 54 High Road, Byfleet, KT14 7QL — 1275 yards to the southeast. 54 High Rd, Byfleet, KT14 7QF — 1273 yards to the southeast. Addlestone — 229 yards to the west. Brooklands Drive, Weybridge, KT13 0SL — 1383 yards to the northeast. Sopwith Drive, Byfleet — 1248 yards to the east. Woodham, Addlestone, Surrey — 1597 yards to the west. New Haw — 1277 yards to the north. Brooklands Industrial Park, Elmbridge — 1164 yards to the northeast. Abbot Close, West Byfleet, KT14 7JN — 326 yards to the east. 74-76 High rd, West Byfleet, KT14 7QW — 1318 yards to the southeast. Trackside Abbot Close Unit 5, Byfleet, KT14 7 — 211 yards to the east. 29 High Road, Byfleet, KT14 7QH — 1254 yards to the southeast. Selsdon Rd, West Byfleet, KT153 — 1585 yards to the west. Unit 6&7 Byfleet Technical Centre Canada Road, Byfleet, KT14 7JX — 319 yards to the southeast. Weybridge — 1629 yards to the east. 54 High Road, Byfleet, KT14 7QL — 1285 yards to the southeast. 457 yards to the southeast.